While the Centre has justified the use of 2011 Census for funds allocation, it is doing little to allay the fears of the state governments. In the wake of radical changes incorporated in the terms of reference (ToR) for the 15th Finance Commission, the southern states are staring at a massive cut in their share of the devolutions from the central government. The Finance Commission is a body set up under Article 280(1) of the Constitution whose primary job is to recommend how revenues need to be distributed between the Centre and states. The recommendations of the 15th Finance Commission headed by former revenue secretary NK Singh will come into effect from April 1, 2020 to March 31, 2025. What has led to massive outrage in the southern states is a particular directive in the terms of reference given to the Finance Commission to follow the 2011 Census instead of the 1971 Census while formulating the share of individual states. Now, this is a tricky subject in many ways: The reason why successive Finance Commissions use the 1971 Census rather than the latest available Census is due to the 42nd amendment to the Constitution in 1976, which mandated a freeze on the population figures; with 1971 Census to be used for purposes of delimitation. This was done with the explicit objective of incentivising states to control their burgeoning population without the prospect of their seats going down in the Lok Sabha. Initially, the freeze was legislated for a period of 25 years but in 2001, the Atal Bihari Vajpayee government extended that for another 25 years till 2026, with the 84th amendment. While southern states, Kerala and Tamil Nadu in particular, have aggressively gone about educating their girl child, and by extension, brought their fertility rate well within replacement levels, the BIMARU states (Bihar, Madhya Pradesh, Rajasthan and Uttar Pradesh) have gone the other way with scant interventions in the social sector. More importantly, it will portend a bigger impasse come 2026 on the question of extending the use of 1971 Census for delimitation. It’s much more significant if one takes into account that a Hindu majoritarian party like the BJP won more than 50 per cent of their total seats from the same BIMARU states in 2014. It will naturally lead to alienation of the southern states and sow seeds of secessionism, if the Hindi speaking states end up cornering most of the taxes at their expense despite the fact that all these states were in the same boat at the dawn of Independence. While the 15th Finance Commission still has the leeway to give the weightage it deems fit to different variables (population among them) it takes into consideration while making the final calculation, it will be nigh impossible to offset the impact of changing the Census from 1971 to 2011. Experts have opined that the Finance Commission could factor in another variable - progress in moving towards replacement level of population growth - to counter-balance the effect of using 2011 population Census. While the BJP-led central government has been targeted by south Indian politicians ranging from Tamil Nadu opposition leader MK Stalin, Andhra Pradesh chief minister N Chandrababu Naidu, Karnataka chief minister Sidharamiah, Kerala finance minister Thomas Issac and Jana Sena leader Pawan Kalyan for drafting terms of reference inimical to the much touted "cooperative federalism", it has been conveniently ignored that the 14th Finance Commission, appointed by the Manmohan Singh government and led by YV Reddy, actually initiated this by giving 10 per cent additional weightage (out of 27.5 per cent) to the 2011 Census. Even such a 10 per cent weightage given to 2011 Census by the 14th Finance Commission ended up negatively affecting the devolution to states like Tamil Nadu whose ratio in the total kitty fell drastically. This has further aggravated the fears of southern states who contribute more in taxes to the Centre. Apart from the Census issue, another contentious ToR flagged by MK Stalin in his letter to the 10 non-BJP chief ministers is the unilaterally imposed "control or lack of it in incurring expenditure on populist schemes" in 4 (viii). It is a genuine concern for states to have whether the centrally appointed non-elected members of the Finance Commission has any right to sit in judgement on "populism". 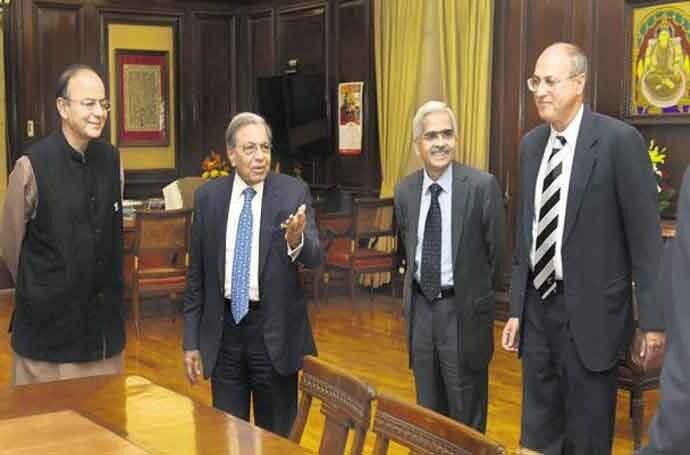 Something deemed populist by the Finance Commission could well be an imperative for a particular state on account of its peculiar constraints. The displaced former Jammu and Kashmir finance minister Haseeb Drabu had already written about this more than a month ago. He had also written in an article that the central government had “passed off value judgements in a leading and loaded terms of reference” for the Finance Commission. There have also been concerns raised about the composition of the Finance Commission itself post the creation of the GST Council - that will decide on the vertical devolution, that is, between New Delhi and the states - finding no representation in the commission. In fact, it has been pointed out that co-opting a member of the NITI Ayog doesn’t make sense in the current scenario as that body has no say in the capex budget of states. Instead of factoring in the changes on account of the GST in the horizontal devolution formula between states, the Centre has inexplicably come up with a weird set of ToR that defies logic and will only aggravate the already strained relations between the southern states and Centre. The 15th Finance Commission has also been asked to factor in the macro-economic impact (corresponding fiscal constraints on the Centre) post the higher devolution to states from the Centre’s divisible pool as recommended by the previous commission. While Prime Minister Modi tried to corner the credit for implementing the recommendations by the 14th Finance Commission, despite the fact that many centrally sponsored schemes and outlays on them were cut down to compensate for the higher devolution, he will have to tread cautiously on the revolt by southern states as it has the potential to foster disaffection and ill-will towards the Centre. As it is, the majoritarian agenda of India’s ruling Hindu nationalist party has already driven a wedge between the southern states and New Delhi. This is reflected in the resistance to Hindi imposition in Karnataka and Tamil Nadu, the unease on the issue of beef in Kerala and loss of goodwill among Telugus due to the perceived step-motherly treatment post bifurcation. Although the Finance Commission is expected to do its best to balance out the concerns of southern states by either reducing the weightage on the population variable or introducing other variables to arrive at a devolution formula, it still has to operate within the ToR. But it is the Union government which has to walk the talk on "cooperative federalism" by accommodating some changes. Or else, this will rightly be dubbed "coercive federalism" by the affected southern states. The writer is a political journalist and lapsed academic.